The Trung Sisters, Trung Trac and Trung Nhi, also known as, “Hai Ba Trung” in Vietnamese are best known for their involvement in leading a rebellion against the first Chinese regime under the Han Dynasty. Their goals were to liberate the Vietnamese people from the rules, oppression and exploitation that the Chinese government were putting them under. When faced with adversity such as the execution of one of their husbands, they were not afraid to unite and take a stance for their country and their people. They were charismatic leaders who were able to gather over 80,000 supporters, many of who were women. Trưng Trắc and Trưng Nhị were the first two women to lead a successful rebellion to overthrow the Chinese Han dynasty tyrants. Their names were derived from the traditional silkweaving of Vietnam, meaning “egg one” and “egg two” (Nguoi Ke Su). Two sisters in families are also considered con gái hai bà trưng as well! This iconic movement demonstrated their leadership, resilience, and perseverance. Scholars of Southeast Asian culture often cite the Trung Sisters as groundbreaking figures in the history of Vietnam as their story gives Vietnamese women a narrative outside the traditional domestic or household roles. The elder sister Trưng Trắc was the widow of Thi Sach, the lord of Diễn Châu in Northern Vietnam who was assassinated because he was plotting with the other lords to overthrow the Chinese dynasty. Soon after his assassination, Trưng Trắc assumed the leadership of the movement. Together, the two sisters and the rest of the aristocracy marched to Lien Lau, which caused the Chinese commander to flee. In the legends, it was told that the two sisters would ride elephants into battle. After a year, the Trưng sisters and their allies held 65 northern citadels. Though the movement was strong, without support of commoners, supplies and trained military forces, they were quickly defeated by Chinese general Ma Yuan and his troops. 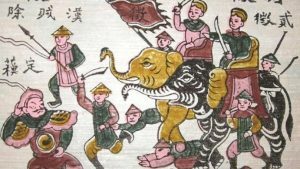 They defeated the Trung sisters at Lăng Bác (near the present site of Hanoi) and Hat Mon, now known as Son Tay. Shortly thereafter the defeat, both sisters, feeling distraught, tragically took their own lives. Their death anniversary is highly celebrated as a holiday in Vietnam due to their bravery demonstrated throughout the rebellion. The Trưng sisters’ involvement marked the start of Vietnamese females rebelling against the Han Dynasty, solidifying their importance in Vietnamese history. Before she even turned 21, she had over 30 successful battles against the Chinese. 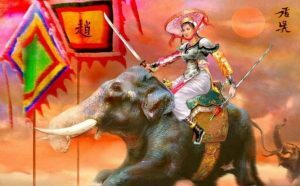 According to legends, she was over 9 feet tall and she rode an elephant into battle. Legends also told that she was also known to be wearing gold armor and have a sword in each hand while she rode into battle, fighting for her life each time . Due to her voice being loud and strong, it motivated the rebels to follow her. Eventually, the Chinese defeated her in battle which plunged her into depression. Like the Trung sisters, Thinh tragically took her own life due to the unbearable sadness. For women in the time of a patriarchal society, it was regarded highly for females to rise into power and fight for the freedom of their country. The movements of women fighting for freedom and rights for Vietnam empowered other women, thus breaking many gender barriers. Due to the notable feats of these female individuals, the term “con cháu Bà Trưng Bà Triệu” was coined. A lot of strong and fearless women we know today can be called this, and we can probably think of a few off the top of our heads right now! These women have influenced the way Vietnamese women stand up to face difficulties and concerns in Vietnam, and empower other individuals to stand up for what they believe in. Vietnam has been able to witness dramatic socio-economic changes throughout the years and continue to do so with the help of programs like: the United Nations Development Program . Armed with the knowledge and the history of some prominent Vietnamese women, UNAVSA hopes more females are empowered to change modern society. Whether it be in North America, Vietnam, or any part of the world, women make a difference for the betterment of society!